Kranjska Gora is an alpine resort town in northwestern Slovenia. Most people come to Kranjska Gora for the ski season. However, if you’re planning a summer holiday, this delightful destination has a lot to offer. Framed by limestone mountains and surrounded by meadows, Kranjska Gora is very easy on the eyes. We stayed two nights at Youth Hostel Nika (excellent breakfast), before hiking across Triglav National Park. We didn’t have a car for this trip, so everything we did was accessible by foot or public transit. These are the very best things to do in Kranjska Gora in just one day. Hiking to Martuljek waterfalls (Slap Martuljek in Slovenian) is a wonderful half-day excursion in summer, suitable for the whole family. If you have a copy of the Cicerone Walking Guide: Julian Alps of Slovenia, this hike is listed as Walk 4. 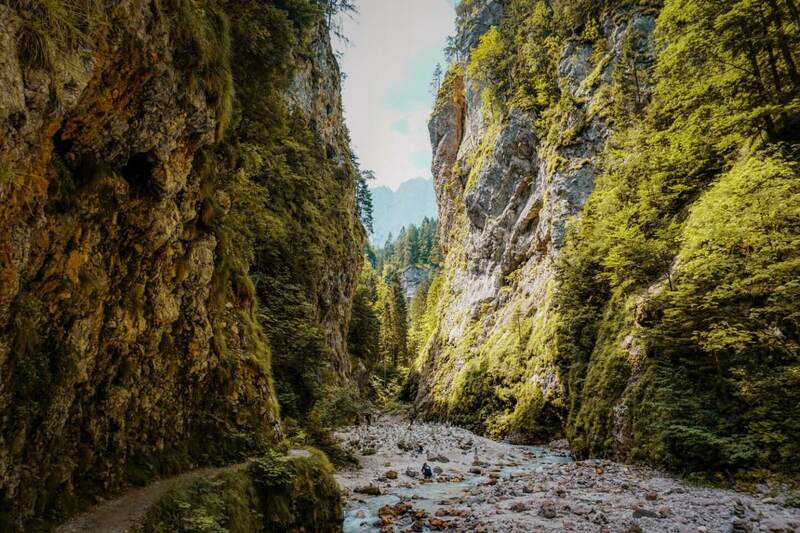 To reach the waterfall trailhead, you can take a 10-minute bus ride from Kranjska Gora to the small town Gozd Martuljek. Check bus schedule here. Alternatively, you can walk an hour to Gozd Martuljek. The walk follows path #5 along the Sava Dolinka River. You’ll hike through the gorge and then ascend to a nice viewing area of the lower Martuljek falls (spodnji slap). Continue on the path until you reach a junction with a wide gravel road. Turn left and head in the direction of Brunarica pri Ingotu (there are signs). Brunarica pri Ingotu is a mountain hut that’s situated on a meadow and surrounded by dairy cows. It’s one of those places out of a storybook. Stop here for a homemade stew, a drink, or simply the mountain view. Next, you can either continue the journey for another hour to the upper Martuljek waterfall (zgornji), or return back to Gozd Martuljek. We didn’t hike up to the upper falls, however, we read that the hike requires a bit of scrambling. Lake Jasna is an alpine lake that boasts one of the best views of the Julian Alps. From the Kranjska Gora town center, it’s a 25-minute walk. You can either walk along the road or more preferably along the Pišnica river. A footpath loops around the lake. There are a few cafés at the lake, but save your appetite for Milka Restaurant. The best time to enjoy the view is in the early evening. As the sun sets, the peaks of the Eastern Julian Alps are illuminated in soft hues of pink and violet. It’s a bewitching site. Zelenci is an emerald-colored pool located in a marsh. The whole marsh area is a nature reserve. There are a trail and a wooden boardwalk that leads to a viewing platform, where you can see the astonishingly clear and green waters of Zelenci. While it may look like just a lake, it’s actually a spring and the source of the Sava Dolinka River. The porous chalk bottom of the pool allows a continuous up-welling of groundwater. You’ll see bubble streams emerging from the bottom. We walked to Zelenci from Kranjska Gora, but biking would have been the better option. You can rent bikes in the town center. If you’re driving from Kranjska Gora, the parking lot is on the left side of the road shortly after Podkoren (6-minute drive). From the parking lot to the spring, it’s a 10-minute walk. Milka is a restaurant and hotel located at Lake Jasna. If you’re looking for a romantic setting, where you can enjoy the sunset over the Julian Alps, come here. The restaurant offers a reasonably-priced set menu, though you can also order à la carte. Their cuisine is delicious, but the location is superb. Vršič pass is the highest road pass in Slovenia and connects Kranjska Gora with Bovec. You can either drive here or take a bus. In high season, buses leave every 1-2 hours. Check the bus schedule here. In Summer, we recommend hiking around the pass and eating lunch at the mountain hut Poštarski dom na Vršiču. After lunch, you could continue your journey to Trenta, or Soča, or return to Kranjska Gora. 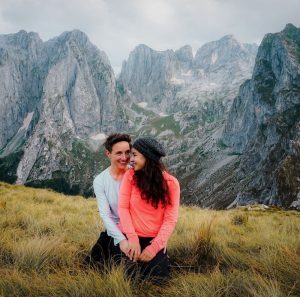 For a relatively easy hike, we suggest hiking to Slemenova Špica, which is a grassy hill and lookout point set amidst the dramatic Julian Alps. The hike should take no more than 3 hours round-trip. From Vršič pass, follow signs towards Sleme. After 30 minutes, you’ll reach the saddle Vratica (1799 m), where the trail splits. To hike to Sleme, you’ll go right (45 minutes). After another ~ 30 minutes, you’ll reach a junction. You’ll see a path to the right signed Grlo that heads to the Tamar mountain hut. Stay to the left. Keep your eyes peeled for another trail intersection. You’ll want to head right. If you continue on the main trail, you’ll end up at the Slatnica saddle. When you arrive in the high grassy meadow of Slemenova Špica, you’ll have epic views of the Southern Limestone Alps. We started our hike across the Julian Alps and Triglav National park right here. 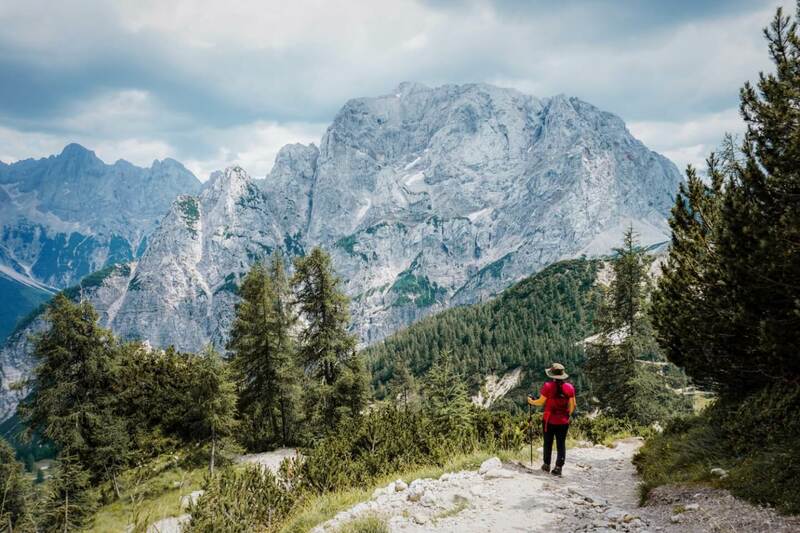 Read Next: Hiking Across Triglav National Park. Budget | Youth Hostel Nika is a budget-friendly accommodation in Kranjska Gora. We had a great stay here and were pleasantly surprised by the bountiful breakfast buffet. Mid-Range | Apartments and Rooms Kaja offers several comfortable and spacious apartments in Kranjska Gora that have been lovingly refurbished. Luxury | Boutique Skipass Hotel is a superb family-run hotel located in the heart of Kranjska Gora. The hotel features an on-site gourmet restaurant. Check out more accommodations in Kranjska Gora here. Such a handy post- I have struggled to find much info on hikes. Have checked out the guide you recommended. I am struggling to find a specific day hike around Pogačnikov dom etc but have read about a circular route over the Luknja pass which starts and ends at Zadnjica valley? Do you have any recommendations around this as I see you covered the area on your multi day hike! Hi Emma! Agreed - we also had a difficult time figuring out how to plan our hiking route. In terms of days hikes, it's possible to reach Pogačnikov dom from Trenta Valley (4.5 hours ascent) and return by the same route (3 hours descent) in one day. Unfortunately, it's not a circular route. I don't know about the Zadnjica valley - Luknja pass route. Can you send me a link, and I'll take a look..? Most Zadnjica valley trails that I'm seeing online traverse Triglav, which isn't feasible in one day.